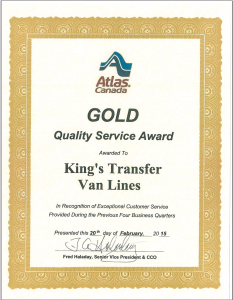 We are pleased to announce that Atlas Van Lines of Canada has awarded us, King’s Transfer Van Lines of Winnipeg a “Gold” Quality of Service award for superior service over the last four business quarters. 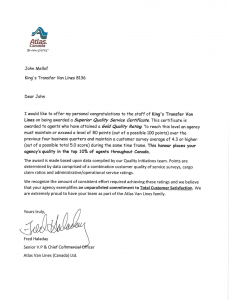 This places King’s Transfer within the top 10% of Atlas Van Lines agent moving companies across the nation in terms of quality. The Atlas Van Lines Quality Awards are distributed based on a combination of customer surveys and efficient handling of internal paperwork. At King’s Transfer Van Lines of Winnipeg, we work hard to make every move a positive experience for our customers and we are excited to accept this award. If you are moving – be it across the city or across Canada – King’s Transfer Van Lines is pleased to help. King’s Transfer Van Lines is a moving company that you can trust. Trust the King of the Movers. I’d also like to take this opportunity to extend a big thank you to our staff for making this happen.